Shashi Tharoor's rival and LDF leader C Divakaran had also called him up on Tuesday morning to express concern for his well-being. 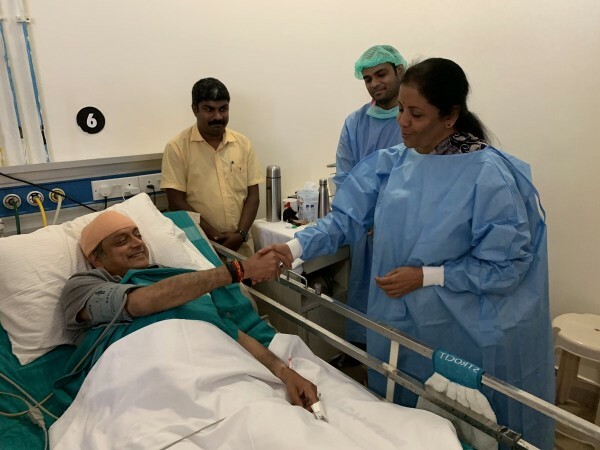 Defense Minister Nirmala Sitharaman visited Thiruvananthapuram MP Shashi Tharoor on Tuesday after the Congress leader was hospitalised after injuring his head during a temple ceremony. 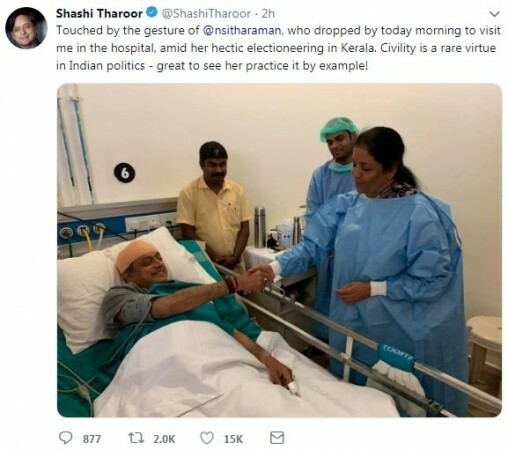 Saying that "civility was a rare virtue in politics", Tharoor thanked Sithramaran in a tweet for visiting him in the hospital and enquiring about his health. Sitharaman is currently in Kerala campaigning for the Bharatiya Janata Party ahead of the 2019 Lok Sabha elections which will be held in a single phase on April 23. Tharoor's rival LDF leader C Divakaran had also called him up on Tuesday morning to express concern for his well-being. The latter tweeted thanking him for his concerns. Tharoor will be defending the Thiruvananthapuram Lok Sabha seat against Divakaran. Tharoor was injured when he was taking part in a Thulabharam ritual at the Gandhari Amman Temple in Thiruvananthapuram. This ritual expects a person to sit on one plate of a balance and banana will be weighed against him on the other plate till it reaches the person's weight. Tharoor hurt himself when the balance broke and fell on his head. It required six stitches.